Levine ended the show shirtless in a possible last-ditch attempt to save the performance. Super Bowl LIII saw the Los Angeles Rams face off against the New England Patriots. For those of us who don’t pay attention to professional football the rest of the year, the halftime show and commercials are the focus of our Sunday night. Unfortunately, this year’s Super Bowl was all around lackluster. To be fair, Maroon 5 wasn’t the committee’s first or even second choice for the halftime show. However, this year saw activism in football spread to the music realm, with multiple artists who were approached declining the Super Bowl offer. Adam Levine started the show off key, uncomfortable and uncharismatic. Interestingly, the more clothes he took off the more confident he seemed to become. In his defense, I know firsthand how expensive tattoos are and with all that ink on his chest, he had to get his money’s worth. I will commend the band on keeping the performance more tightly centered on their music instead of distracting antics; however, it could have retained some excitement. The biggest disappointment for most was the lack of “Sweet Victory.” Perhaps the cruelest trick Maroon 5 could have pulled was including the beginning clip of the “SpongeBob SquarePants” episode “Band Geeks” only to use it as an entrance for Travis Scott’s explicit set. One fan went so far as to create a “how it should have happened” video compilation including “Sweet Victory” in the set. The best song of Maroon 5’s set was “She Will Be Loved” from their hit album “Songs About Jane,” with an intimate walk through the crowd complete with personalized lanterns. I for one would have much rather watched the Foo Fighters’ Super Saturday Night performance with guest appearance by Queen drummer Roger Taylor. I admit, however, the Foo Fighters are not quite mainstream or pop-y enough for the main Super Bowl event. 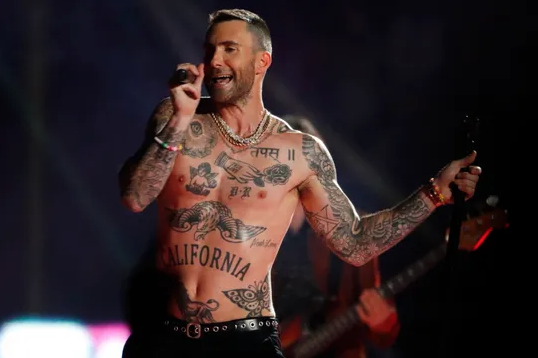 Either way, Adam Levine’s shirtless “Moves Like Jagger” finale may have excited lonely housewives, but I think Levine needed an ego boost before his 40th birthday later this year.